LookTel Money Reader instantly recognizes currency and speaks the denomination, enabling people with visual impairments or blindness to quickly and easily identify and count bills. Simply point your device's camera at a bill and the application will tell you the denomination in real-time. Several currencies are supported including the US Dollar, Euro, British Pound, Canadian Dollar, and Australian Dollar. Click here to read more. LookTel Recognizer allows users with visual impairments or blindness to instantly recognize everyday objects such as packaged goods in the pantry, identity cards, soda cans at the grocery store, or CDs in a music collection. Once a library has been built, users can simply point the iPhone's camera at an object and the phone will recognize and describe the item instantly. Click here to read more. This app provides a basic introduction to VoiceOver and the gestures used throughout iOS. Persons new to VoiceOver and IOS are guided through the tutorial with a pleasant mix of facts and entertainment. Once the app is started with VoiceOver running, the text and elementary games provide a practice of the basic gestures used with VoiceOver and iOS.Click here to read more. Breadcrumbs GPS is a location and orientation app designed specifically for the navigation needs of people with visual impairments or blindness. Using the iPhone as a pointing device, Breadcrumbs helps blind or visually impaired travelers locate orientation points, or "breadcrumbs", on a route. Click here to read more. 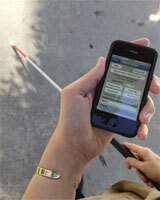 We are currently developing a full suite of assistive solutions for persons with visual impairments or blindness. Click here to learn more.